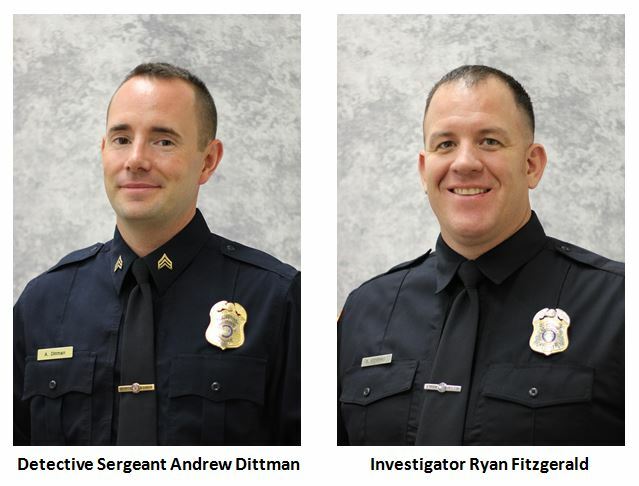 Detective Sergeant Andrew Dittman and Investigator Ryan Fitzgerald of the La Crosse Police Department received a thank you from the Onalaska Police Chief for their work in locating and arresting suspected bank robber Jonathan L. Smith. Smith is accused of robbing the Community Credit Union in Onalaska on February 27th. A search for the suspect by multiple law enforcement agencies led to the discovery of the suspect’s vehicle abandoned in the Industrial Park on the North Side of La Crosse. Officers believed the suspect was trying to escape on foot. Det. Dittman and Inv. Fitzgerald later took it upon themselves to surveil Bridgeview Plaza in the City of La Crosse. Inv. Fitzgerald noticed a person who was acting suspiciously and pacing aimlessly around the plaza. The suspect had changed his appearance and clothing by that time, so as not to draw law enforcement suspicion toward him. Det. Dittman and Inv. Fitzgerald approached the subject. They were able to identify Jonathan Smith as the suspect in this crime and arrested him. Great job by all Law Enforcement officers involved in this incident which resulted in the quick arrest of a suspected bank robber in our community. See the original press release from Onalaska Police Department for details.